The key element of this sqadia.com medical V learning lecture is complications of fracture. 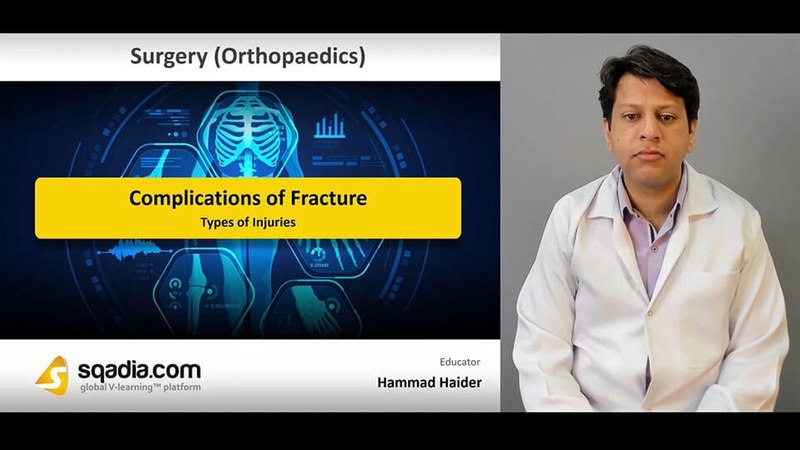 Starting from types of injuries, compartment syndrome, to delayed union, non-union and malunion, orthopaedic surgeon comprehensively elaborate all the possible complications. Moreover, avascular necrosis, growth disturbance, bed sores, and heterotopic ossiﬁcation is also enlightened. Conclusively, joint disorders such as osteoarthritis and complex regional pain syndrome are also considered. General complications of fracture involve blood loss, shock, fat embolism, and cardiorespiratory failure. After that, local complications of fracture are discussed. Among early complications, visceral injury is pursued along with its treatment. Next subject of discussion is nerve injury which is particularly common with fracture of the humeral shaft. Subsequently, indications for early exploration comes under consideration. Primarily educator explains compartment syndrome which arises when there is increased pressure within one of osseofascial compartments due to severe ischaemia. Then classic features of ischaemia are highlighted. Following this, discussion on treatment is carried out. Some other early complications are also elaborated. One of the late complications is the delayed union which arises due to biological, biomechanical and also patient related factors deliberated in succession. Subsequently, Dr. Hammad Haider notifies about non-union complication. Malunion is presented later on. For treatment purpose, both conservative treatment and operative treatment are reported. 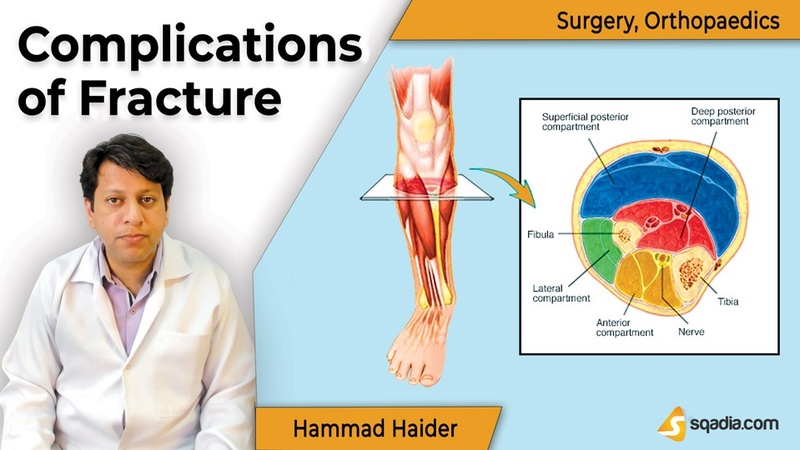 Initially, Dr. Hammad Haider talks about avascular necrosis. Head of femur, proximal part of the scaphoid, the lunate are the regions developing necrosis. After that growth disturbance is explained which causes damage to physis. Skin over sacrum and heels is prone to bed sores. Then heterotopic ossiﬁcation is pursued which occurs after an injury. Alongside, comments are given on tendon lesions and nerve compression. Joint instability is the first subject of discussion. Joint stiffness causes synovial adhesions and complex regional pain syndrome. This is followed by the elaboration of osteoarthritis through diagrammatic illustration. After that orthopaedic surgeon tells that complex regional pain syndrome is of two types i.e. type 1 and type 2. Their treatment modality is also conversed about.